The decline of mainstream political parties and the resurgence of populism have been evident across the West for some years now. This is not limited to certain charismatic leaders or particular policy issues. Something far bigger and deeper is at work. Witness the collapse of the parties that governed Italy throughout the post-war period; the decline of France’s centre-right and Socialist parties; and the upheaval amongst Democrats and Republicans in the United States. Throughout the West, not just particular parties but entire party systems are losing their relevance. By “party systems” I mean parties arranged in a competitive equilibrium along a left-right, worker-capitalist ideological axis. Having dominated the 20th century and presided over enormous social and economic change, these systems are suddenly disintegrating around us. Well-prepared, experienced leaders are unable to mobilise voters. Established parties – even entire countries – are falling into the hands of charismatics and extremists. Where is this all going? To quote both Niels Bohr and Yogi Berra: predicting is hard, especially about the future. But as I argue in an article just published in the Journal of Democracy, we can open an analytical window into the future by examining the experience of Bolivia. Bolivia? Yes, Bolivia. Precisely because it’s one of the poorest countries in the Western Hemisphere, Bolivia’s politics were never as institutionalised nor its parties as strong as those of richer countries. But it has suffered many of the same economic shocks, technological disruptions, and social and environmental changes as far more developed countries. Which is why the disintegration of its politics began earlier and proceeded faster than elsewhere. Adjusting for context, Bolivia offers insights into how political disintegration works and clues about where it may be going. During the second half of the 20th century, Bolivia’s political party system was a surprisingly robust component of a famously fragile democracy. Why, early in the 21st century, did it suddenly collapse, to be replaced by Evo Morales and his ethno-populist Movimiento al Socialismo (MAS)? First, consider the old system. Bolivia’s many coups notwithstanding, from 1953 onward, its politics was characterised by parties arrayed along a left-right, labour/peasant-vs-business/capital axis typical of the 20th century, and this arrangement was remarkably stable. So dominant was this system that the same parties and individuals survived civil disturbances, guerrilla insurgency, hyperinflation, economic meltdown, striking social change, and many coups, returning repeatedly to take up the reins of power. Why did politics suddenly collapse in 2003? Here the conventional wisdom is mistaken. It is simply not credible that a dispute over a gas pipeline to Chile, the old enemy, killed off not just a president and his government but Bolivia’s political parties, party system, and the dominant axis of political competition. All of these had survived far worse. Others blamed poor economic performance, but that is not credible either. The economy had grown continuously since 1986. A system that survived hyperinflation in the 1980s was not toppled by 2.7 percent growth. 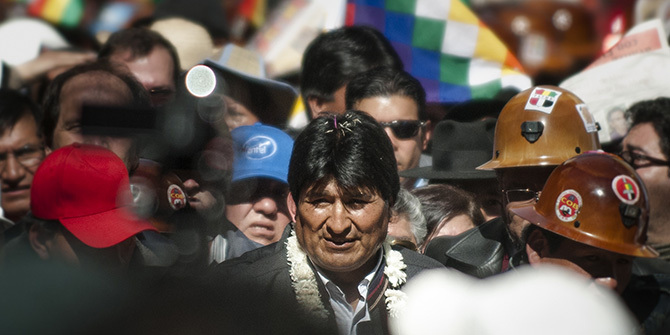 The collapse of Bolivia’s politics was caused by something far deeper and longer in the making. It was a political earthquake that replaced the primary axis of political competition with a new axis better matched to its real, major social cleavage. Political competition pitting workers against capitalists never made sense in a poor country that lacked both. Competing over cultural and ethnic identity made much more sense in a society riven by both. What lessons does the Bolivian experience hold for the West? First, political party systems, even obviously successful ones, fall apart once they lose their moorings in the issues voters care about most. Stories of political collapse tend to be told in terms of wars and economic crises. These are not essential. Politics can and do collapse in peacetime when the economy is boring. What is essential is the link between parties and social cleavage. Where it is missing, parties are doomed. Second, the old worker-capitalist divide of Western politics is increasingly obsolete. As manufacturing and heavy industry decline, they take with them a class of workers who strongly identify with each other against a common enemy. The changing nature of work, from a full-time, long-term commitment between employers and workers, to flexible “gigs” with few benefits or guarantees, plus increasing levels of informality, is further undermining left-right politics. Throughout Europe, parties founded to represent industrial workers cannot hope to win elections, or even retain a purpose, while “workers-as-workers” disappear. This is why the current turmoil in France’s Socialists, UK’s Labour, Germany’s Social Democrats, and the Netherlands’ Labour is not circumstantial, but existential. Third, Bolivia illustrates how hard parties find it to change their core values and positions because they have invested so much in building reputations based on them. 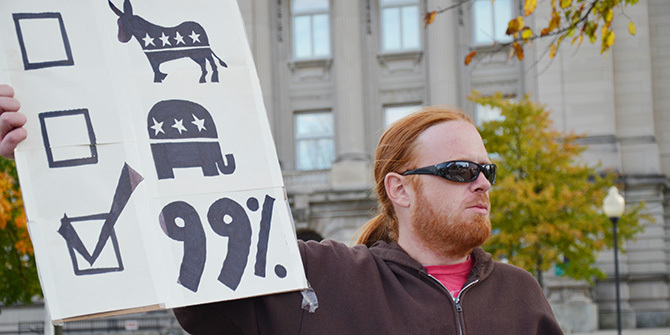 Both politicians and activists oppose large shifts. As society changes, parties tend to get left behind. Political-system change tends to take the form of replacement: new parties and movements arise and push aside established parties that are no longer relevant. Fourth, in which underlying cleavage will a new politics anchor itself? Although difficult to predict, the most compelling narratives today, in the West as in Bolivia, revolve around race, ethnicity and place. Such a new politics will play out differently in different countries depending on their histories and on how identity interacts with geography. In countries where no group is dominant, party systems may gel around identity per se. But where one group dominates, a new axis may emerge linking this group’s party at one end with a cosmopolitan party that denies, or seeks to minimise, identity differences at the other. We see this in Europe and the US now, as well as in Bolivia. The end of the liberal project? In historical terms, this is an extraordinary reversal. The Enlightenment believed in the equality of mankind. Liberalism – in the classic sense of the word – sought to overcome identity-based cleavages. In countries like the US and France, liberals built not just politics, but national identities based on shared ideals, not skin colour or cultural traditions. Parties arrayed on a left-vs-right axis were accessible to everyone, regardless of identity. The danger now for the West is that a new politics is forged around race, religion, ethnicity, and language. This could mark the end of the liberal project. Fifth, any new politics of identity is bound to be far more exclusive, built on categories only some can access. This would represent a danger not just for certain countries but for democracy as an ideal. The reason is that the political compromises necessary to make democracy work are easier to find in economic space. Technological and organisational change have a habit of increasing the size of the economic pie, facilitating positive-sum policy options that are mutually beneficial. For example, 19th-century revolutionary pressures faced by many Western countries were allayed by education, health, and welfare reforms. These hugely improved workers’ lives, but at the same time made them, and hence firms, more productive. Workers benefited and capitalists did too. Mutually beneficial compromises are harder to find in identity politics. Divisions are more rigid, and rewards more often positional, measured in terms of status. As a result, such contests tend to be zero-sum: for me to win, you must lose. Positive-sum games are fewer, and the risk of conflict greater. The demise of left-right politics – and the rise of identity clashes – threatens to alienate us from each other even as it removes the means of finding agreement. It is a sad and dangerous turn for the West that may forever change who we are. Jean-Paul Faguet is Professor of the Political Economy of Development at the London School of Economics. He is also Chair of the Decentralization Task Force at Columbia University’s Initiative for Policy Dialogue. His research blends quantitative and qualitative methods to investigate the institutions and organisational forms that underpin effective governance and rapid development. He has published extensively in the political science, economics, and development literatures, including Is Decentralization Good for Development? Perspectives from Academics and Policymakers (Oxford University Press, 2015), and Governance from Below: Decentralization and Popular Democracy in Bolivia (U of Michigan Press), which won the W.J.M. Mackenzie Prize for best political science book of 2012. I find your Bolivia analogy incomplete and yet compelling. From Colombia, I have often wondered why Bolivia’s economy will grow 4.7 percent while Venezuela colapsed. No identity politics with Maduro? How does the zero-sum theory of yours hold when comparing Bolivia’s strong and consistent economic growth with Argentina’s ever recurring crisis?